Ogilvy, James A.. "Fur Trade Routes". The Canadian Encyclopedia, 08 February 2018, Historica Canada. 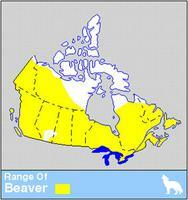 https://www.thecanadianencyclopedia.ca/en/article/fur-trade-routes. Accessed 24 April 2019. Throughout the period of the historical fur trade, water routes were the natural "highways," and canoes (later boats - principally York boats) the vehicles. 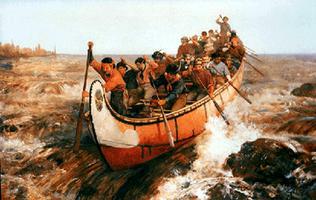 Throughout the period of the historical fur trade, water routes were the natural "highways," and canoes (later boats—principally York boats) the vehicles. The placement of trading posts depended on the presence of numbers of Indigenous peoples willing and able to trade, and on the ease of transportation to and from them. In the Atlantic region, the absence of a dominant river system resulted in only a localized traffic in furs, but the French tapped a vastly greater potential via the St. Lawrence River and its tributaries. Québec and Montréal, they received furs from the Montagnais, Algonquin, Huron and Ottawa, who travelled various rivers from the King's Domain, or came down the Ottawa River from Lake Timiskaming and beyond. But most important to the later trade was the route the French themselves developed to the west via the St. Lawrence, Ottawa and French rivers; by the 1740s they had extended it to the head of Lake Superior and thence to the prairies. After the Conquest of 1759–60, this route was adopted by anglophone independent traders and then by the North West Company. 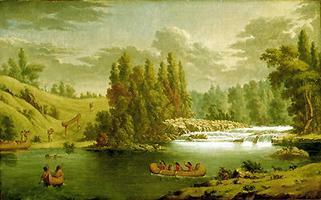 From Kaministiquia (later Fort William) the route inland began at Grand Portage and twisted north and west through a series of rivers and lakes marked by over 50 tortuous portages. 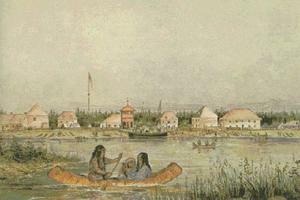 From Lake Winnipeg, the traders headed west via the two branches of the Saskatchewan River; many went northwest via Methye Portage [ Portage La Loche ] to Lake Athabasca. The other major route was that of the London-based Hudson's Bay Company through Hudson Bay. When that company began to move inland in 1774 with the construction of Cumberland House on the Saskatchewan, most of its traffic inland was by the Hayes River from York Factory. In the direct competition that ensued between the HBC and other traders, the rivals paced one another westward across the prairies. Eventually, the routes proceeded via the Howse, Athabasca and Yellowhead passes through the Rocky Mountains and down the Columbia River to the Pacific region. After 1814, HBC ships rounded Cape Horn to service Pacific posts by sea. As the more southerly trade declined, traders moved down the Mackenzie River into the western Arctic and from the East Main (east coast of Hudson Bay) inland. 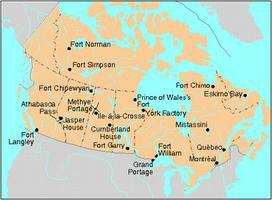 Access to Fort Chimo and Labrador was generally by sea. 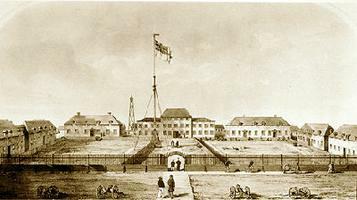 After the merger of the NWC and HBC in 1821, shipments through Montréal ceased. The Fur Trade in Canada: An illustrated historyA book that reveals the Aboriginal roots of the fur trade and the development of the major fur trading centres across Canada. From indigo.ca.